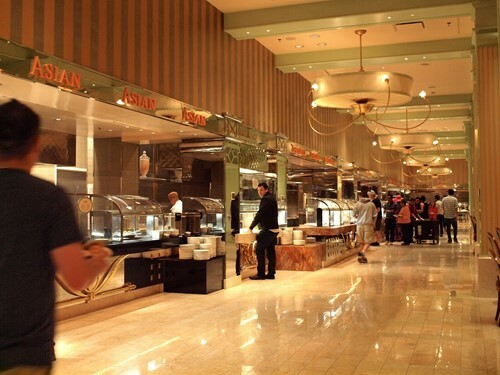 The The Buffet is a restaurant inside Aria Resort & Casino in Las Vegas, Nevada. This was my favorite buffet! This place has a wow factor. You really do eat with your eyes before your mouth here. It’s hard to take in all the food and decorations at this place. The food is excellent! And the selections are very good. I have a rule about not eating at the same place twice, but the buffet was so good I went here for brunch twice in one week. Highly recommended!!! Leagues better than Bellagio's buffet! A bit hard to flag down staff for drink refills, but they're decently friendly once you do. Wide variety of food and dessert selection, and some plaques indicating food allergens are helpful. Not the most vegetable-oriented, so if you're looking for that, wouldn't recommend.